Dedicated to enriching the lives of young people through an awareness of the beauty and diversity of nature. Thank you for the great time we had last week. We learned a lot and had fun. We'll never forget our week with you. Cindy Parker-Brown joined ENH in July as the new Finance Mgr. Fall is always a time of great change: the first signs of yellow on the trees, the waning daylight hours, and the dawning of a new school year with new faces. This fall ENH also finds itself in the midst of exciting and significant change. First and foremost is the establishment a new ENH administration office at the Sempervirens Outdoor School. Within this office we now have a full-time finance manger who is renovating our bookkeeping system and human resources services. The changes are steady and impressive! However, all change comes with some sadness, and in our case we sadly say goodbye to Arlene Tucker, our long-time bookkeeper, friend and surrogate mom. Arlene was there when her daughter Laura and friend Gary Nightengale sat at her kitchen table and with Arlene's help wrote the original Articles of Incorporation for Exploring New Horizons in 1979. Now, after 23 years, Arlene is retiring and is enjoying a new career as a full-time SF Giants fan! Our second major change involves reviewing and revamping all of our infrastructure. Over the last several years ENH has grown, but the numerous documents that support the program have remained the same. No longer! With professional assistance provided by the INNW Fund, we recently reviewed, rewrote and began implementing new By-laws, Articles of Incorporation, school service agreements, job descriptions and employee handbooks. You can read more about these and other exciting changes right here, on our newly redesigned web site. You may have noticed a remit envelope enclosed in this newsletter. This is part of ENH's efforts to develop a support base for our scholarship fund. In 1996 ENH provided $4,600 in scholarships to economically disadvantaged students. assistance to go up again this year To maintain this level of support, we are asking for your help. We greatly appreciate your generous support ! In 1979, ENH founders Laura Tucker and Gary Nightengale sat at the kitchen table of Laura's mom, Arlene, and filled out a pile of forms to create Exploring New Horizons. From that moment on, Arlene has been intimately involved with ENH, first as a mom providing the two "kids" with confidence and cash (she and her husband Harding donated $2,000 to get the program off the ground), then as an office manager, lending her typewriters and telephones, and soon after as bookkeeper, a role she held until last August. To many who called us regarding contracts and general business, she was the Voice of ENH. Now Arlene is enjoying her new role as the biggest Giants fan in the Central Valley. For any of you who were fortunate enough to chat with Arlene over the years, you know how much she loved this program and all of us. We wish Arlene a wonderful retirement! In San Ramon, just off Crow Canyon Road, there is a school that has a very important connection to the Exploring New Horizons network. The school is called Venture, and it offers its students, from Kindergarten through Adult Education, alternatives to classroom study. 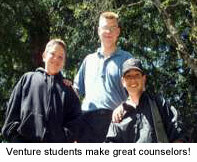 We are grateful to Venture for providing us with enthusiastic and responsible cabin counselors year after year. Each week during the academic year, our residential programs in Loma Mar and Boulder Creek need a combined average of 30-40 motivated high school students to be cabin counselors. The counselors choose to volunteer a week of their busy lives to be a big brother or sister, mentor, and friend to the 5th and 6th graders participating in our programs. Although it is an exhausting and difficult responsibility, it is equally rewarding. Ron Houston heads the counselor recruitment program at Venture High School as part of the Venture Independent Study program. 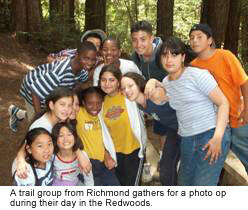 For many years, Ron has served as our most valuable high school contact person, often convincing students at the very last minute to spend five days with kids in the Santa Cruz mountains. Alicia Dickerson, currently the Program and Garden Coordinator for Sempervirens Outdoor School, has recruited counselors for both ENH at Loma Mar and SVOS. "Ron has been exceptionally giving in his effort to recruit quality high school students for our counselor program", she says. "We cannot thank him enough for all the help he has offered". This past spring, after so many years of sending Venture high school students to ENH, Ron organized a group of 5th and 6th grade level Venture students to participate in our Loma Mar program for the first time. 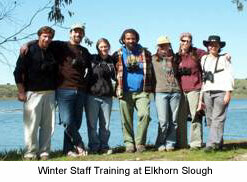 A former ENH student himself, Ron realized the benefit of experiencing outdoor education at a young age. Thank you, Ron and Venture School! We would like to extend a tremendous "Thank You!" to all the generosity the following groups have shown towards ENH programs. "Thank you so much for taking such good care of our (high school) students. They all had such a great time...You apparently have an outstanding staff, as my kids say they were the best they've ever seen." 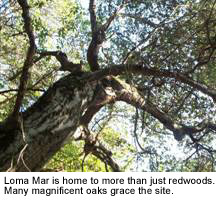 We are now in our fifth week here at Loma Mar, and once again we hear the lovely sound of children's voices rising up through the redwoods. It's good to be back! We have a strong veteran staff this year; everyone of our naturalists is a returnee! We also have two new interns, who round out our great staff. And so, lead by these fine folks, the students are having great adventures in the marsh, at the creek and ocean, and under the glorious redwoods. Our garden is looking particularly pretty this fall, thanks in large part to the efforts of two staff members, Troy Smith and Alex Jones, who have installed an awesome drip irrigation system. Alex has also brought hot and cold running water to the garden house so we can keep those little hands clean! The pond by the bird blind is now finished, and our spring chickens have begun laying fresh eggs! Our staff is also keeping warm thanks to a generous donation of a new wood stove by my new bride, Mary Drake. And finally, it was a great honor last October 5th to have my new and old ENH family present to witness my marriage to the lovely Mary Fehringer. Thank you all for helping us start our "happily ever after" lives together! 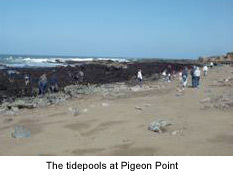 Autumn has arrived at Pigeon Point and change is in the air. As of last December the lighthouse was closed to public for tours after a large piece fell off from the upper balcony area. Bids are finally being accepted for the job, but the work is on hold until the Coast Guard decides the future of the lighthouse. Now that most ships are guided by global positioning systems, the Coast Guard feels the structures are no longer necessary. So, as many of you have read in the newspapers, the lighthouses are being sold, primarily to state governments and historical societies. Now Pigeon Point's time has finally come. As of this printing, California State Parks hopes to acquire the site, and we have been told that if this happens, it shouldn't significantly impact PPEEP. Another change is that our terrific naturalist/surfer/historian friend Jeffrey Parry has accepted the position of manger of the Pigeon Point Youth Hostel. We have always had a great relationship with Hosteling International, and having a former staff and good friend in this position is wonderful. The last change is trying to get accustomed to not having Arlene Tucker, our dedicated bookkeeper and life long friend of Exploring New Horizons around. Arlene, you will truly be missed! The new school year has begun here at the Sempervirens Outdoor School! After a very eventful summer, we are heading into our second fall season in style. The new office trailer is up and running with finishing touches that include two beautiful new redwood decks! Our new office is also the headquarters for Exploring New Horizons as well as being the main SVOS information hub. It comes equipped with a wing for our executive director and financial manager, a staff meeting area and library, as well as a clothing store and coffee maker. It sounds bigger than it is but we are all thoroughly enjoying our cozy new space. I am very excited to announce the addition of a challenge course to the SVOS program! Adrian Kissler of ON COURSE INC. with his son Josh, built a ten-element course that features a "spider's web", a "rock-tree traverse", a "whale watch", and "wild woosy" to name just a few. The students with their naturalist will be focusing on teambuilding skills as they communicate, cooperate, and take a chance to accomplish the various challenges. I would also like to welcome three new additions to our SVOS family. Steve "Snake" Maes, Oliver "Huckleberry" Steinfels and Alison "Kestrel" Young bring lots of experience and character to our program. Returning to SVOS this fall are Alicia, Saralyse, Melanie, Scott and Ulli. This year Ulli is in a new position as garden coordinator. As the new program director for SVOS, I am very excited for the upcoming year and am confident that with this very talented and dedicated staff it will be the best year yet! 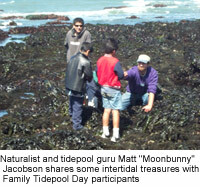 The First Annual Family Tidepool Day at Pigeon Point Lighthouse was a great success. It was an exceptionally sunny and warm May day at the coast , with a nice low tide to enjoy and explore. About 20 families joined the ENH staff and Board members for morning tidepooling, lunch, and a slideshow to highlight a child's experience at our residential programs. We enjoyed sandcastle-making on the beach, experienced a few splashes on the slippery rocks, saw sea lions porpoising close to shore, and discovered many creatures in the pools. What a day! We would like to thank all the participants for sharing this incredible day with us. 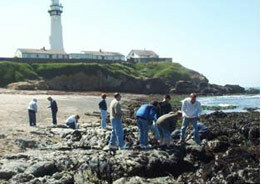 We would also like to thank our amazing and talented staff for volunteering their natural history expertise at the tidepools. Thanks to Peet's Coffee and Tea, New Leaf Markets, and Trader Joe's for their generous donations of food and drink, and last, but certainly not least, we say thanks to Hostelling International for donating the space for our event. If you know someone who would like to receive our newsletter and other ENH announcements, please email Cindy Parker-Brown at cindy@exploringnewhorizons.org.